Those who have watched the 1994 movie "Forrest Gump" might consider Tyreke Evans a one-man box of chocolates for the Pacers. You never know what you're going to get from him. On the first day of the month, he started against Detroit at Bankers Life Fieldhouse and scored 13 points, hitting 4-of-6 3-pointers. Two nights later in Detroit, he scored six points in another start, hitting 1-of-13 shots. He followed that with a solid 12-point outing off the bench against Boston, adding seven rebounds. He then sat out Sunday's game against Brooklyn to rest a sore knee, but looked fresh as a starter in Wednesday's game in Atlanta, contributing 27 points on 9-of-14 shooting - including 5-of-8 3-pointers - along with five assists. Predicting what he'll do in the upcoming playoff series against Boston is a dicey proposition, but his mindset appears clear. He's motivated and optimistic. "I'm definitely going to be aggressive," he said. "It's going to be an exciting playoff run. I'm excited, our team is excited. …. This is what we've played for all season." There's often a strong correlation between Evans' stat line and the state of his right knee. He's had it injected twice this season with platelet-rich plasma, and responded well each time. He scored 19 points on 7-of-9 shooting at Atlanta after the first shot and 17 points on 6-of-9 shooting following the second one over the All-Star break. He won't have another shot before Sunday's playoff opener in Boston, believing his knee is sound enough to hold up. He bumped it in the game against Orlando on March 30, requiring an ounce of fluid to be drained from his knee, but will do nothing more than wear a kneepad in the playoff series as long as no further problems develop. 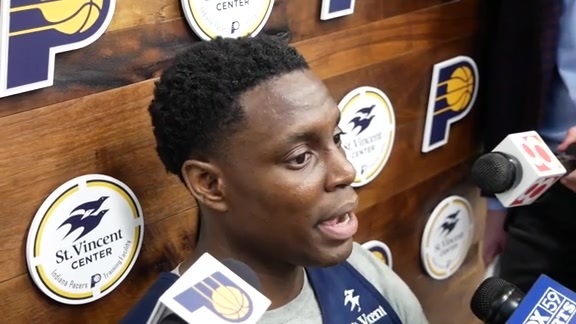 Evans had the option of sitting out Wednesday's game in Atlanta, as all the Pacers' rotation players but Darren Collison wound up doing, but he wanted to play to regain a rhythm. He followed that up by going to St. Vincent Thursday evening, an off-day for the players, to work out and shoot. He rode a stationary bike for 20 minutes, then got up 500 shots with rebounding help from his cousin, Mike. "When you have an off day and don't really work out, you come in kind of sluggish," he said. "I wanted to keep my momentum going and my rhythm going, and I feel pretty good." He feels better than that emotionally. Evans just completed his 10th NBA regular season, but has just four playoff games on his resume. He started for New Orleans in its first-round series with Golden State in 2015, but suffered a bruised left knee after playing 11 minutes in Game 1. He came back to contribute 16 points, 10 rebounds and seven assists in Game 2 and 19 points, four rebounds and eight assists in Game 3, but the Pelicans were swept by the eventual champion Warriors. Despite his injury and the harsh outcome of that series, Evans looks back on it fondly. "The atmosphere was just ridiculous," he said. "I'm looking forward to this one, too." The Pacers need him to play well. Evans brings elements to the second unit nobody else can bring, particularly the ability to execute pick-and-rolls with Domantas Sabonis and power his way to the basket for layups of his own. He misses as many as he hits, particularly when his knee isn't healthy enough to provide enough lift, but his overall impact can be exceptionally positive – particularly when he's hitting 3-point shots. 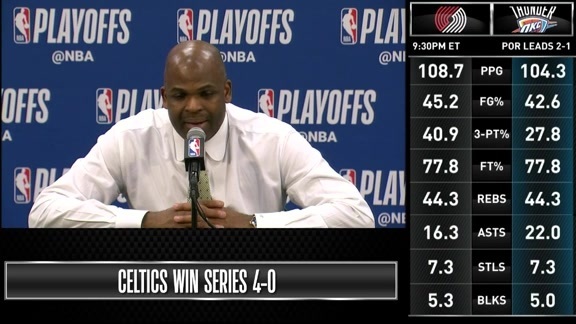 "Tyreke has been a big part of how we got here," coach Nate McMillan said. "We can't and won't forget what got us here. It was good to see him get a rhythm and put the ball in the hole the last game. This time of year, you need both units to play well." For those scoring at home, Evans' stats compare fairly favorably with those of the player he replaced in the Pacers' rotation, Lance Stephenson. Evans averaged 10.2 points in 20.3 minutes, shooting 39 percent from the field and 36 percent from 3-point range. He also averaged 2.9 rebounds, 2.4 assists and 1.7 turnovers. Stephenson averaged 7.2 points in 16.5 minutes, shooting 43 percent from the field and 37 percent from 3-point range. He also averaged 3.2 rebounds, 2.1 assists and 1.3 turnovers. The primary difference now is that Evans gets to play in the playoffs and Stephenson does not. The final judgment of Evans' season will be determined by what happens going forward. Edmond Sumner still was basking in the glory of his game-winning free throws on Friday, two days after the fact. His teammates wouldn't let him forget. Sumner had played in just 22 games for the Pacers before Wednesday's game in Atlanta, for an average of 8.2 minutes. But he got to play 29 minutes and 45 seconds against the Hawks as most of the Pacers' rotation players rested. He made the most of it, scoring 22 points. He hit just 5-of-14 field goal attempts, but 9-of-11 foul shots – most memorably, his final three. 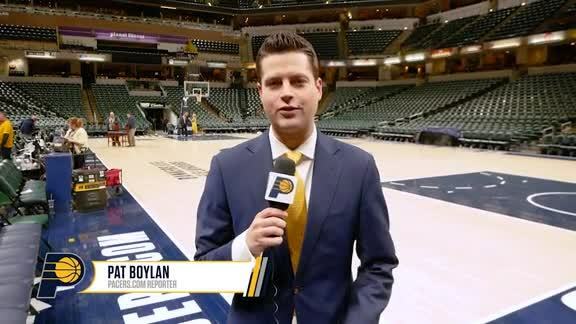 Sumner was fouled on a desperate 3-point attempt from the left corner off an inbound pass with 0.3 seconds left, and hit all three to give the Pacers their one-point victory. It was a play eerily similar to the one involving Virginia's Kyle Guy in the NCAA Final Four game against Auburn. Guy, a Lawrence Central High School graduate, was fouled in the left corner with 0.6 seconds left and hit all three to send the Cavaliers to the championship game, where they defeated Texas Tech. Sumner wasn't watching that game, but saw the video clips of it on social media. While every Pacers follower watching Wednesday's game, as well as McMillan, seemed to instantly recall Guy's moment when Sumner was fouled, Sumner did not. "I wasn't thinking about that at all," he said. What he was thinking about was taking a stand for the Pacer reserves who were getting a rare opportunity that night. "Just wanted to win it for the young guys," he said. "We talked before the game, we wanted to show everybody we could compete and get a win. I wanted to make sure I could take care of (business) so we all could go celebrate." The celebration began in the postgame locker room, continued on the plane ride home and still wasn't forgotten when the players showed up for practice on Friday, following a day off. Sumner has been tagged with nicknames such as Mr. Clutch and Icewater. More importantly, the moment injected a jolt of confidence heading into the off-season. While his attention currently is turned toward the upcoming playoff series against Boston, he's also looking forward to an off-season of Summer League play and workouts. He weighs between 180-185. 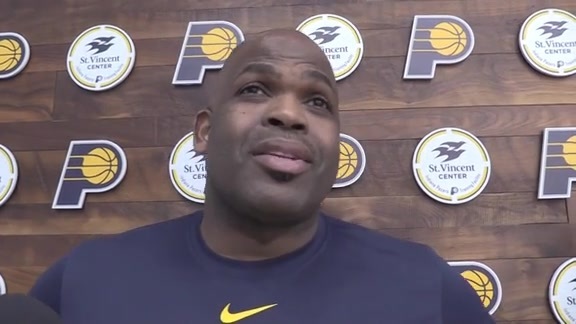 He said the training staff considers him one of the Pacers' strongest players relative to his weight, he would like to become stronger and add a few more pounds without compromising his quickness. The goal then becomes earning a spot as a rotational player next season. Sumner likely won't see playing time in the playoffs other than garbage time unless injuries create an opportunity, but he ended the regular season favorably, with what he called a "surreal" moment. "It was big," McMillan said. "That's a pressure situation. Reminded me of the NCAA championships. They were clean; didn't roll around or anything. They were dead center. Gave him confidence and certainly gave us confidence in that group."